The Islanders lived up to their name by being the first crew to reach the Isle of Wight. Josh Taylor, Alan Morgan, James Plumley and Gavin Sheehan are just behind world record time as they push to the south of IOW, nine miles ahead of Team Hallin Marine. 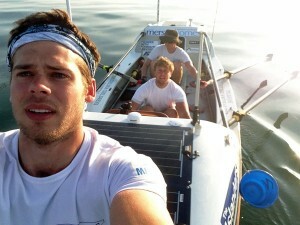 Oarsome Adventures, in third, are narrowing the gap to Team Hallin, who are only nine miles ahead. At 14.00 Pure Gym in fourth place recorded the fastest time of 4knots just off Brighton. Team Savoir Faire, the pair of Josh Tarr and Jason McKinlay, are approaching Beachy Head. The Coast Girls, Sally Kettle and Charlene Ayres aregamely battling against a headwind near Margate.